Abstract: The performance of container terminals needs to be improved to handle the growth of transported containers and maintain port sustainability. 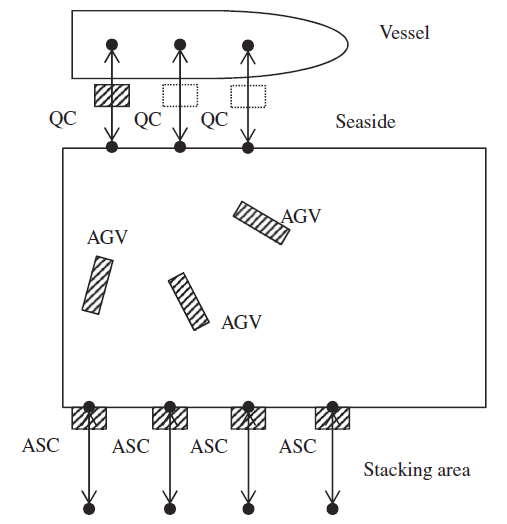 This paper provides a methodology for improving the handling capacity of an automated container terminal in an energy-efficient way. The behavior of a container terminal is considered as consisting of a higher level and a lower level represented by discrete-event dynamics and continuous-time dynamics, respectively. These dynamics represent the behavior of a large number of terminal equipment. The dynamics need to be controlled. For controlling the higher level dynamics, a minimal makespan problem is solved. For this, the minimal time required by equipment for performing an operation at the lower level is needed. The minimal time for performing an operation at the lower level is obtained using Pontryagin�s Minimum Principle. The actual operation time allowed by the higher level for processing an operation at the lower level is subsequently determined by a scheduling algorithm at the higher level. Given an actual operation time, the lower level dynamics are controlled using optimal control to achieve minimal energy consumption while respecting the time constraint. Simulation studies illustrate how energy-efficient management of equipment for the minimal makespan could be obtained using the proposed methodology. Reference: J. Xin, R.R. Negenborn, G. Lodewijks. Energy-aware control for automated container terminals using integrated flow shop scheduling and optimal control. Transportation Research Part C, vol. 44, pp. 214-230, July 2014.